This dish is meatless so, roughly cut the aubergine, peppers and onion in big pieces and set aside. Rise the chickpeas and open the vegetable soup. Set aside ready to use. In a deep sauce pan, heat 3 tablespoons of sunflower oil, then, soften and brown the aubergines and onions together with a pinch of dry thyme (2-3 minutes). Now add the peppers and chickpeas and cover the lot with 500ml of vegetable stock. Cover and leave to simmer for 15 minutes on medium heat. After the 15 minutes, empty the contents of the tinned soup in the pot with garlic, salt black pepper. Stir, cover and leave to simmer for another 10 minutes on medium heat still, making sure to stir occasionally to avoid burns. Meanwhile prepare the couscous. Put 250g of couscous in a deep pan with a 25g knob of butter or 2 table spoons of oil and a pinch of salt. Place the pan on medium heat to brown the couscous a bit. This should take only about 5 minutes do not leave this unattended as the couscous burns very quick. Stir constantly for the whole 5 minutes. What we are looking for is a nuttier taste to the couscous. So, when this is done, remove from the hob and pour on it 250ml of boiled water. Stir to make sure that water has covered every single grain, then cover the pan with its lid. 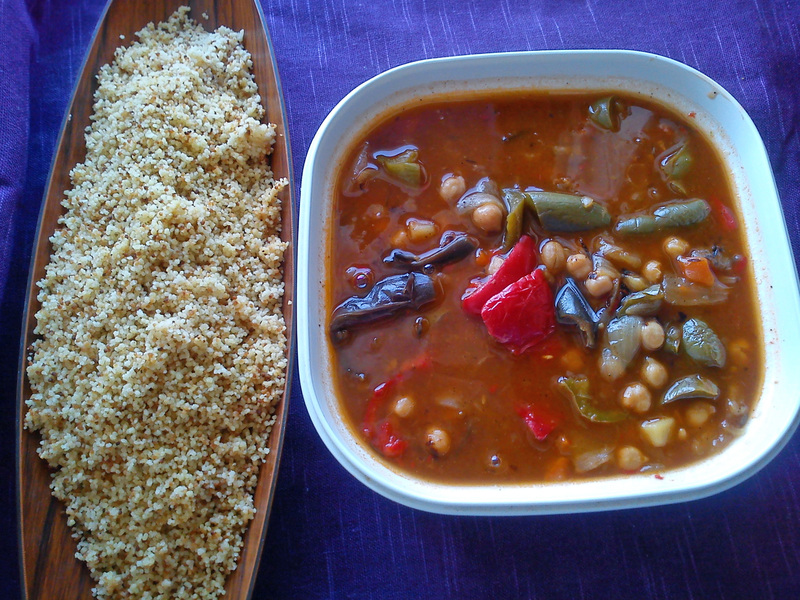 Leave to rest for about 10 minutes, the time for the couscous to absorb the water and double in volume. Using a fork, fluff the couscous which by now should not be wet. Serve as suggested.